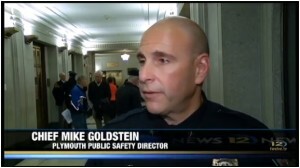 Plymouth police chief Mike Goldstein was at the Capitol last week, shilling for Senator Ron Latz’s gun control bill, SF2980 (watch the channel 12 video here). Do you think this is the best use of the chief’s time, and of your tax dollars? Tonight, at the Plymouth City Council meeting, Second Amendment supporters will ask the Council to remove gun control from its legislative priorities. A strong show of support by Plymouth residents will help convince the Council to do the right thing. We apologize for the late notice; this all came up very quickly. Please show up, wear your GOCRA shirt, and make your voice heard. Regardless of whether you go, please email the city council and tell them you expect them to respect, not infringe, your Second Amendment rights. 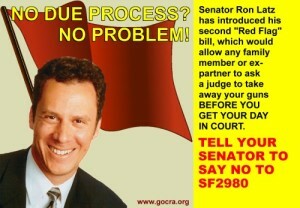 Senator Ron Latz (DFL-46) has reintroduced his California-style “red flag” bill, SF2980, which would allow family members (no matter how distant), or any (current or ex-) girlfriend, boyfriend, husband, or wife to ask a court to have your guns taken by court order. Then, you would have to go to court at your own expense to try to get them back! Help us stop this: contact your senator, and demand that he or she oppose this unconstitutional bill. Sign up for GOCRA gun rights emails, and we’ll always keep you up to date, and provide you with tools to easily contact your elected officials. As we told you about last week, the DNR is pushing a ban on using lead shot for hunting in over half the state. Last week, we testified in favor of State Representative Tom Hackbarth’s HF3209, which would prevent the DNR from this unilateral regulation. The bill passed the first committee with an 11-3, vote. The next hearing is Wednesday morning at 10:15. If you can make it, don’t forget to wear your GOCRA shirt (or another maroon shirt)!